Members of the welfare organization "Aid Through Employment" in Vilna, 1931-1932. In Vilna there were many mutual aid endeavours. Some of them helped the public with medicines and food, others – through providing employment. The Society for "Aid Through Employment" was established at the end of the 19th century by a donation of Dr. Benjamin Finn. The society trained the poor of the city in a range of professions. It established a factory for sorting paper for recycling, a modern launderette, and an underwear factory, in which tens of thousands of undergarments were produced for the Russian army. The society opened a vocational school, a carpentry factory that became renowned from afar, a sandal factory, and courses for craftsmen. It even founded daycare centres and schools for the children of the workers. The activities of the society were publicized across Congress Poland (Królestwo Kongresowe), and the Warsaw community decided to establish a similar institution. Its operations were funded by the JCA (Jewish Colonization Association), hundreds of local donors, and the revenues of its various ventures. It continued functioning until the outbreak of WWII. The "YEKOPO" Aid Organization helped those injured in WWI with charity, loans and migration; the "Vilna Jewish Aid Committee" helped tradesmen and craftsmen with small loans and financial advice; the ORT network financed vocational courses in manufacturing and agriculture, as well as loans; the Jewish Women's Association helped women gain professional training, set up a housekeeping school that won support from the authorities, ran cultural activities, ran a library, and opened a daycare centre for children of working women; the Association for the Jewish War Disabled worked to obtain employment, discounts and financial support for its members; the Association for the War on Begging helped the city's beggars start small-time trades; the Association for Jewish Orphans, most of whose administration were women, supported hundreds of orphans living in institutions or with private families with money and training; and the Association for the Deaf and Dumb, "Comfort for Mourners" and "Aid for Brides" also operated in the city. The veteran Home for the Elderly provided hundreds of elderly people with a large kitchen, dining room, clinic, pharmacy, synagogue, religious library and even a bathhouse with baths. The Home was supported by the community, the municipality, the JNF, donations, membership fees, and collection boxes in private homes and stores. It was aided by real estate income and bonds. The demand for places at the home was larger than the supply. The old Visitors' Synagogue was replaced by a new one consecrated in 1935, with 10 rooms and 20 beds, as well as a meeting hall. Visitors were allowed to stay for ten days, and were provided with meals free of charge as well as Torah lessons in the institution's kloize (study hall). The "Inexpensive Restaurant" that was established in 1881 fulfilled an important role in the life of the Jews in the city, and even provided meals for the poor of other religious faiths. It operated at times of peace and of war, survived the changes of authority, and served over 100,000 meals every year, a quarter of them, free food for the underprivileged. Its large dining room could hold up to 700 diners. In 1936, the restaurant served 150,000 meals, most of them at greatly reduced prices. The restaurant was run by a committee established by the notables of the community, and was funded by donations, concerts and revenues of meetings held in its large hall. From the end of the 19th century until the eve of WWII, other charities for the elderly and the needy operated in Vilna, such as the "Beit Lechem," "Mishan Lechem Bederech Kavod," "Matan Lechem Bekavod" and "Me'angei Shabbat" aid organizations. The world economic crisis of 1929 affected the Jews of Vilna, and brought about the establishment of aid organizations for Jews who had lost some of their income, providing them with money and food, especially for Jewish holidays. Some of these meals were served in restaurants and some, handed over in secret. Dozens of recipients of support from the "Mishan Lechem Bederech Kavod" organization wrote public letters of appreciation, which included the following, "The food was provided in such a way that we did not feel we were being given charity." Volunteers for the "Me'angei Shabbat" organization often distributed the food in secret; they would come to the recipient's house before the Sabbath, lay a basket of food at the doorway and hurry away, so that the provider and the recipient did not see each other face to face. In the "Ma'angei Shabbat" daycare centre, the dining hall was built in such a way that the recipients ate in private, without causing shame to one another. 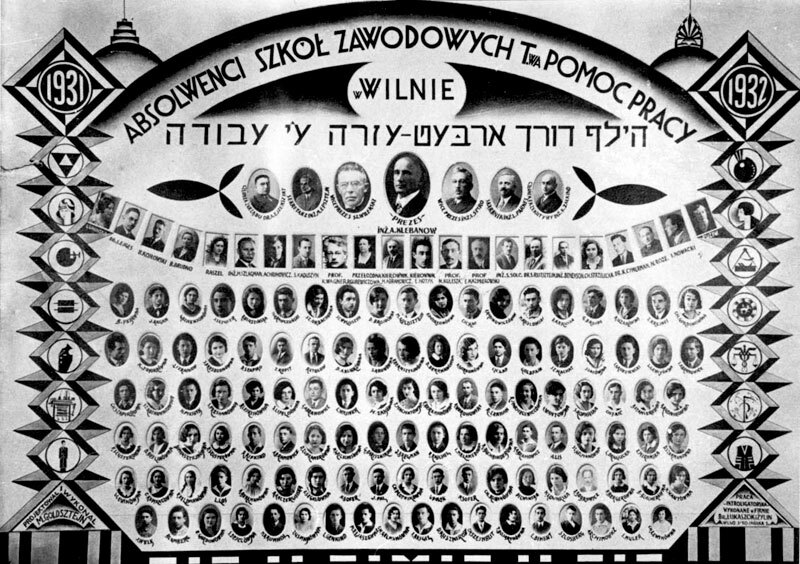 Thousands of Jews from Vilna were aided by these organizations, which were supported by some one hundred philanthropists from Vilna and abroad, mostly from the United States.